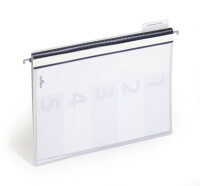 By inserting the filing strip in the fastener, the DURAPLUS quotation folder and the clear view folders 2580 and 2573 can be stored in files and ring binders. White Clip with green stripes. For 1 - 20 sheets. Bag with 5 pieces. 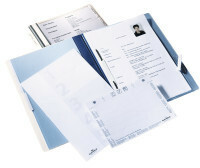 For personalised subdivision or with ready-made form (personnel file). With inside pocket on back cover for unpunched documents. With 5 divisions and 5 separate 8cm filing mechanisms, as per ref. 2555. Three organisation papers so that the file may be used as a machine file, car or rent file. Back cover can be labelled. With tab, blank inserts and suspension rail. 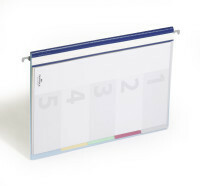 Five distinct folders in one for perfect organisation of your documents. 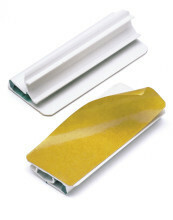 The file has 5 coloured sections, each with a separate tab and 8cm filing mechanism. 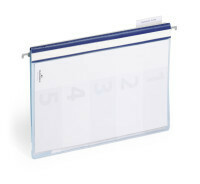 Ideally suited as a project file, credit or insurance file. Cover the filing mechanism within folders with 8cm fastener to enhance appearance and prevent damage to the filing prongs. 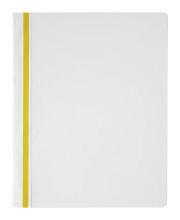 Suitable for all DURABLE folders.